Sazerac has created a limited edition American-Canadian blended whisky that pays homage to Sam Bronfman, the founder of Seagram Company. Created by Sazerac’s master blender, Drew Mayville, Mister Sam is a blend of some of the firm’s “finest” American and Canadian whisk(e)ys. The whisky has been bottled at Sazerac’s Old Montreal Distillery in Quebec, Canada, and will be released in limited quantities once a year. Bronfman, who was affectionately known as ‘Mister Sam’, emigrated from Russia to Canada in the late 1800s and headed up Seagram until his death in 1971. Seagram was one of the world’s biggest distillers whose assets went on to form the businesses of conglomerates Diageo and Pernod Ricard. The group’s relationship with Sazerac started in the 1940s, when Sazerac’s owners became one of the first distributors of Seagram brands in the US. Today, Sazerac owns 15 former Seagram brands, including Seagram’s V.O., Seagram’s Five Star, and Seagram’s ’83, along with its own distillery in Montreal. Sazerac completed its refurbishment of the Old Montreal Distillery last year and started production of Canadian whisky at the site for the first time in decades. Master blender Mayville also has a personal connection with Seagram, having worked at the group for 22 years. Each bottle of Mister Sam is presented in a wooden box that includes a copy of From Little Acorns, a book penned by Bronfman that details the history of Seagram’s. 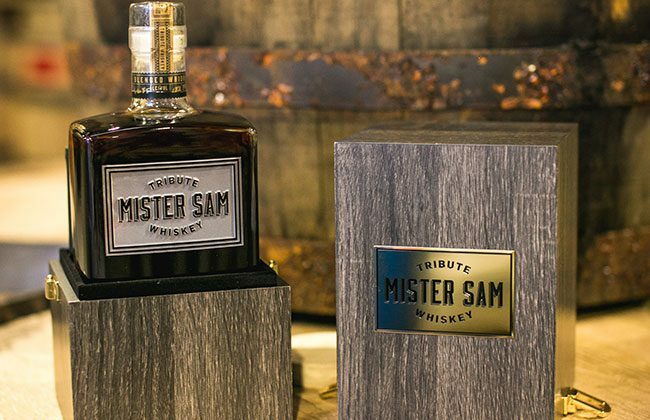 Just 1,200 bottles of the 2019 iteration of Mister Sam have been released and will be sold in the US and Canada only. The hybrid whisky has been bottled at 133.8 proof (67% abv) and has an RRP of US$249.99.